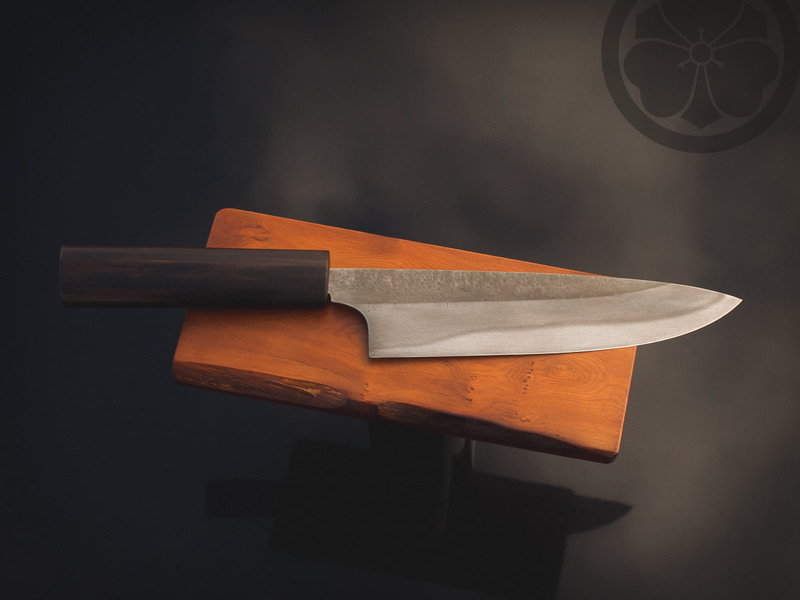 A serious fusion style kitchen tool hand forged from a Model T leaf spring and mounted with a chocolatey Macassar Ebony handle. 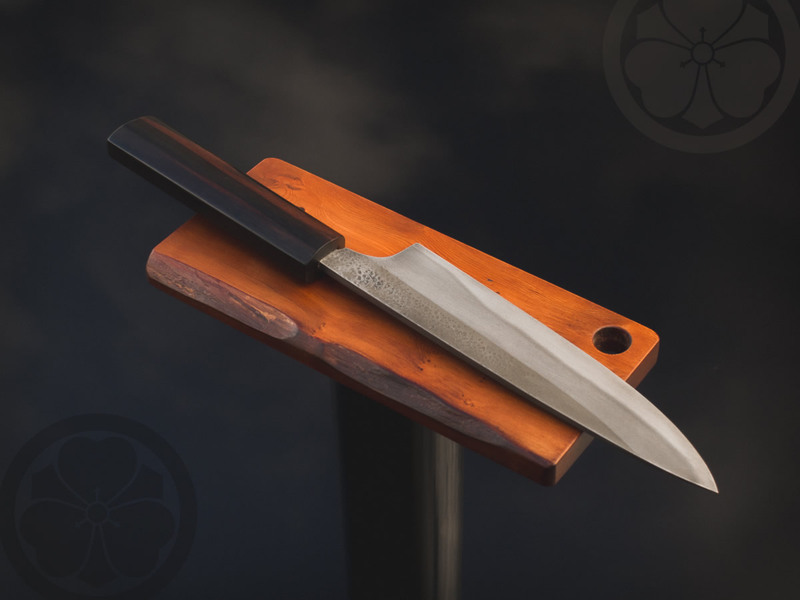 This sturdy blade with hon-yaki swordsmith style edge hardening was hand forged from a verified Model T leaf spring. 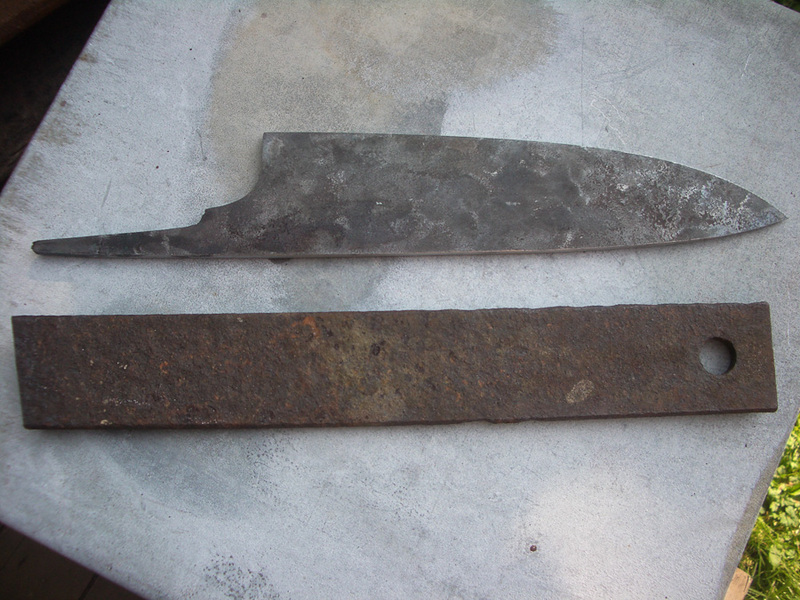 The edge is tempered quite hard to take and hold a keen slicing bevel. 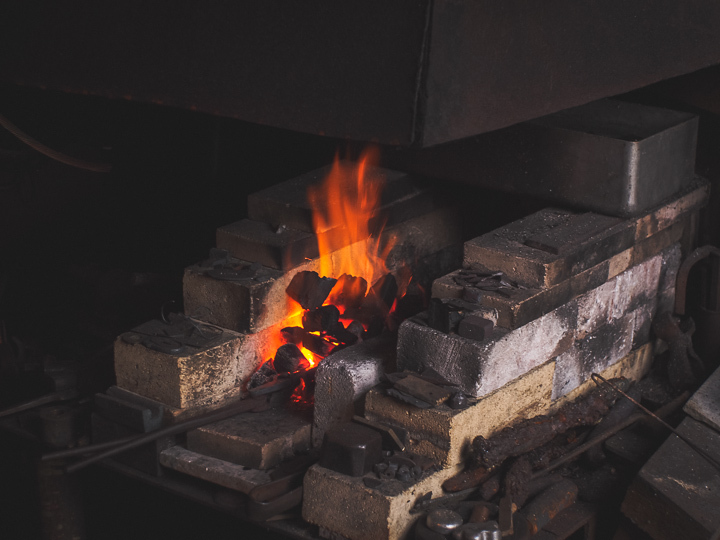 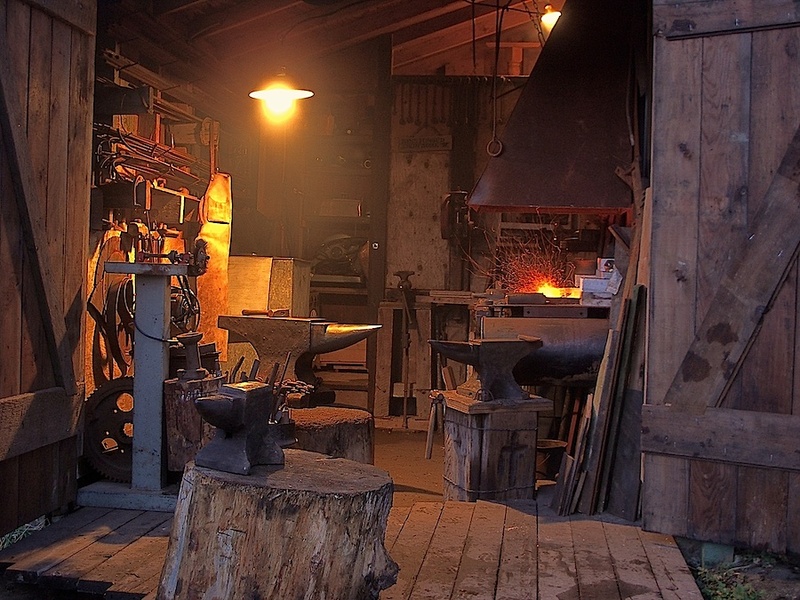 After witnessing firsthand the toughness of French racing car components, Henry Ford was the first to develop and produce vanadium steel in North America, using various alloys of it for all parts of the Model T car. 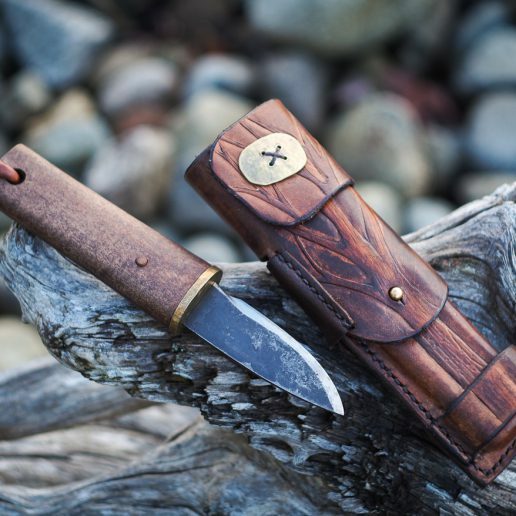 The generous handle is made from a beautiful piece of striated Macassar Ebony. 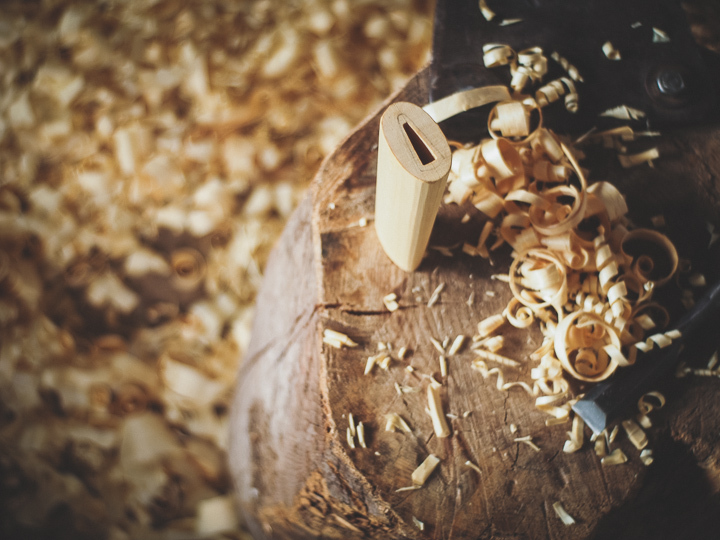 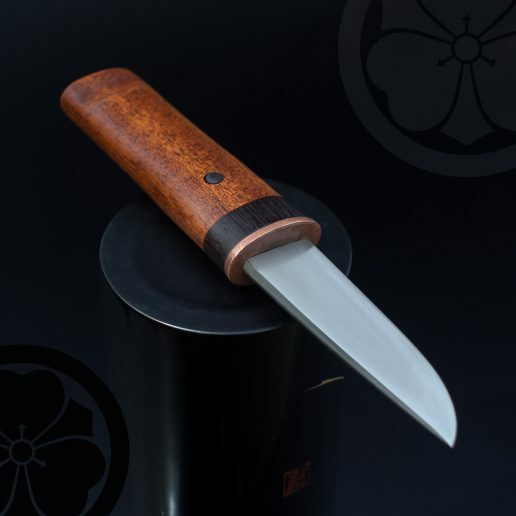 Blade construction is muku and the cross section is a fusion style slightly right-handed single bevel but with a western style edge so it can also be used as if it were a symmetrical double bevel. 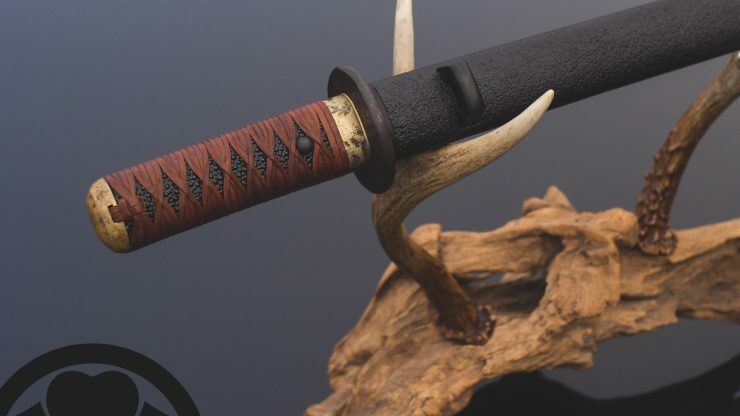 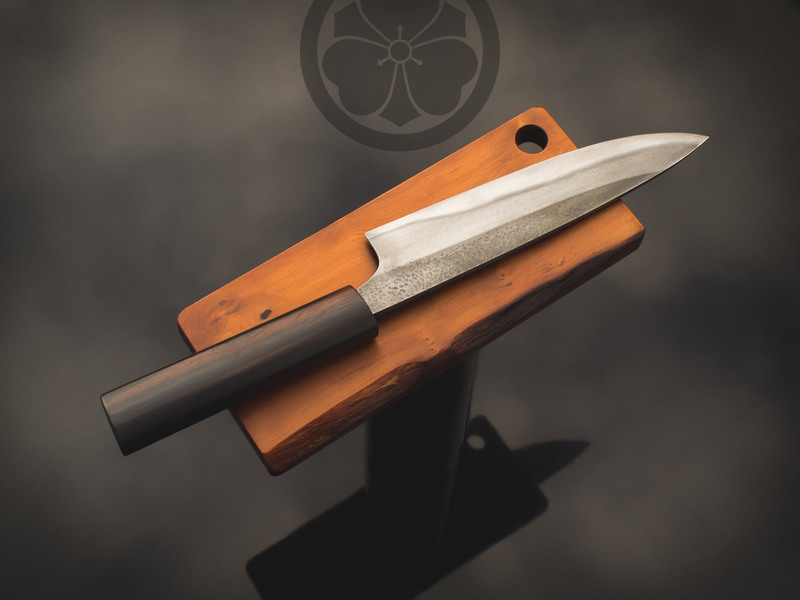 It has some tsuchime style hammer texture towards the spine and a greyed working polish that reveals the strong hamon and the grey tones of this particular steel. 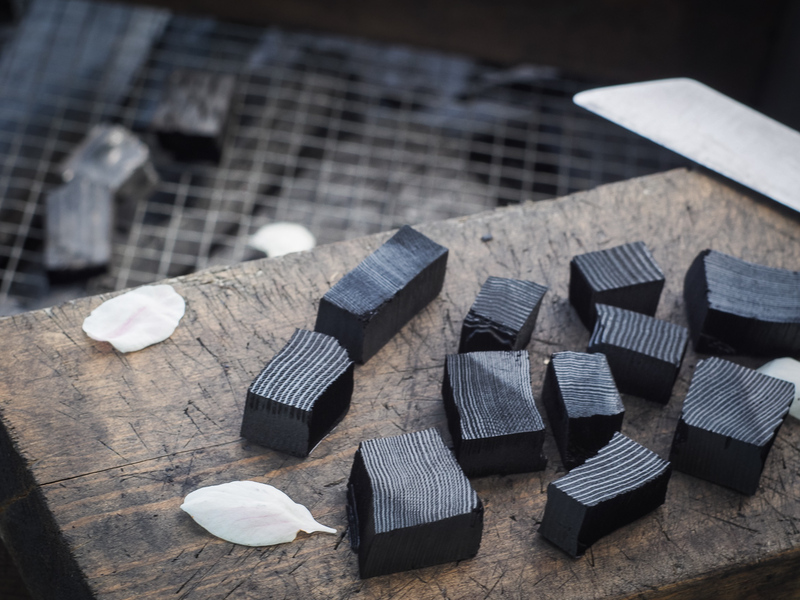 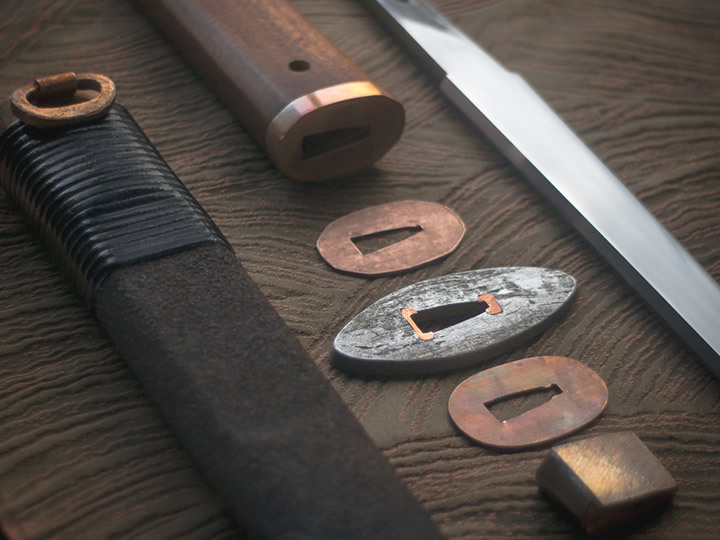 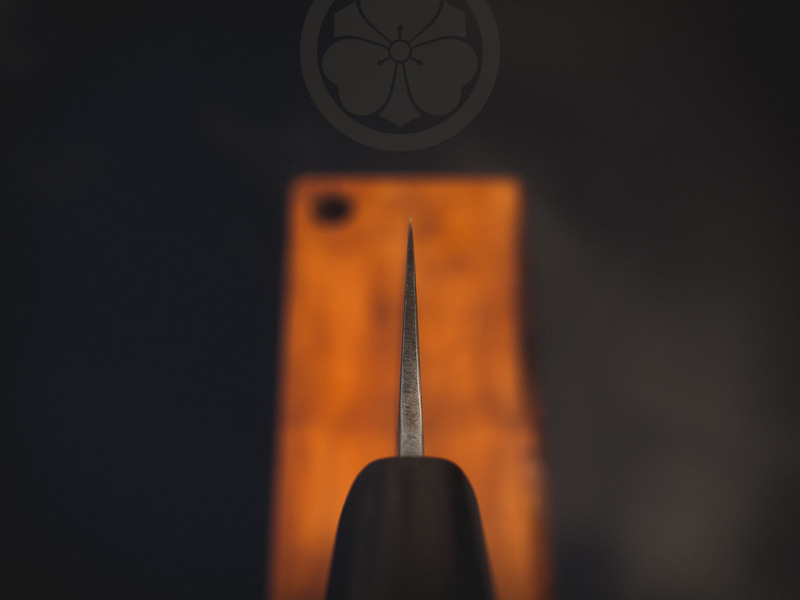 Because of the hard Japanese-style temper, the edge should be honed with fine waterstones and a strop rather than a western sharpening steel. 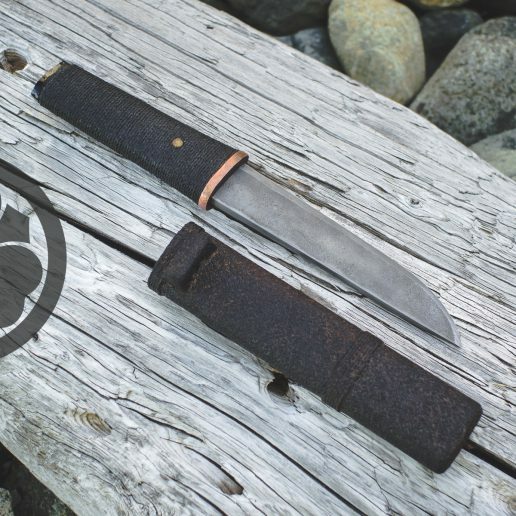 The generous handle is well suited to those that prefer more substance or have larger hands. 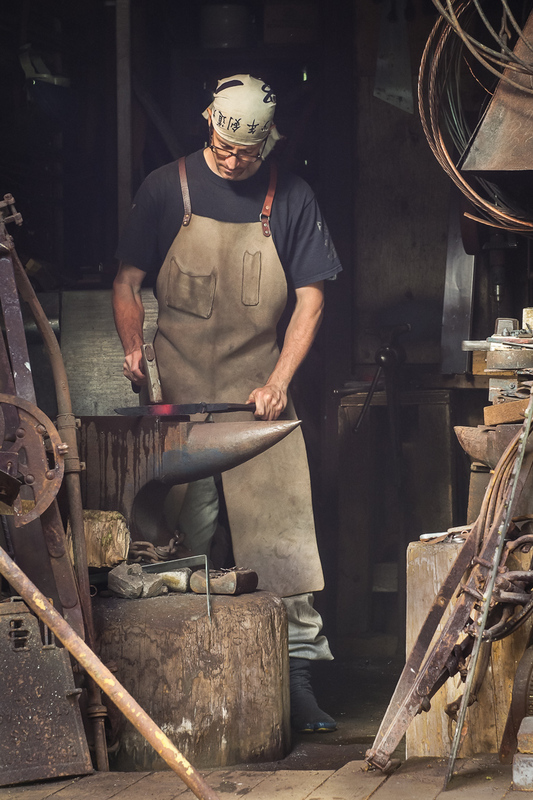 The balance is weight forward when held in normal grip and slightly forward when held in close grip. 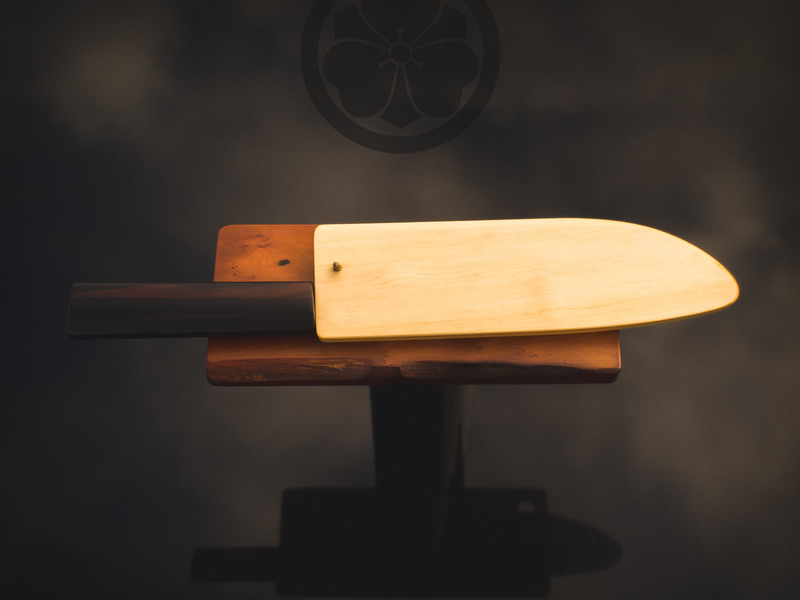 The handle has been hand sanded and coated with pure tung oil for a totally natural finish and the handle is mounted with a pressure fit kusune (pine resin glue) combination and sealed with beeswax. 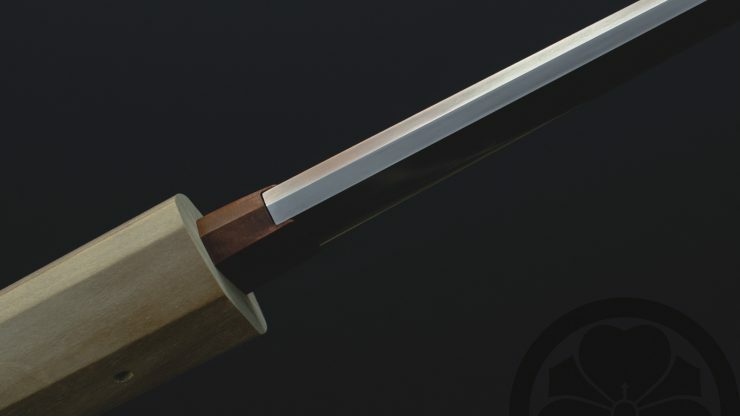 The blade is just under 10″ long, the overall length is about 16″, and the spine starts at 5mm with a full distal taper. 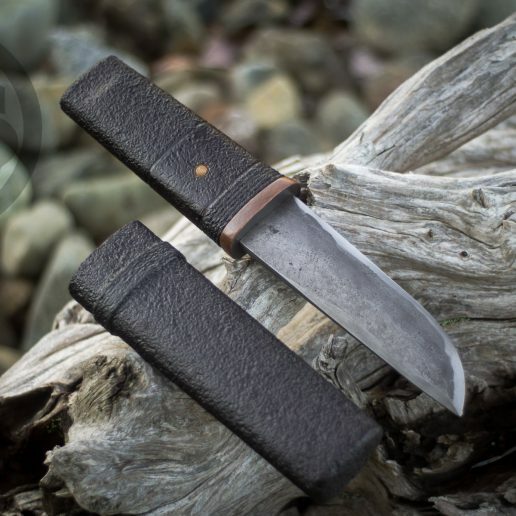 This piece is accompanied by a Nootka Cypress storage scabbard with bamboo retaining peg. 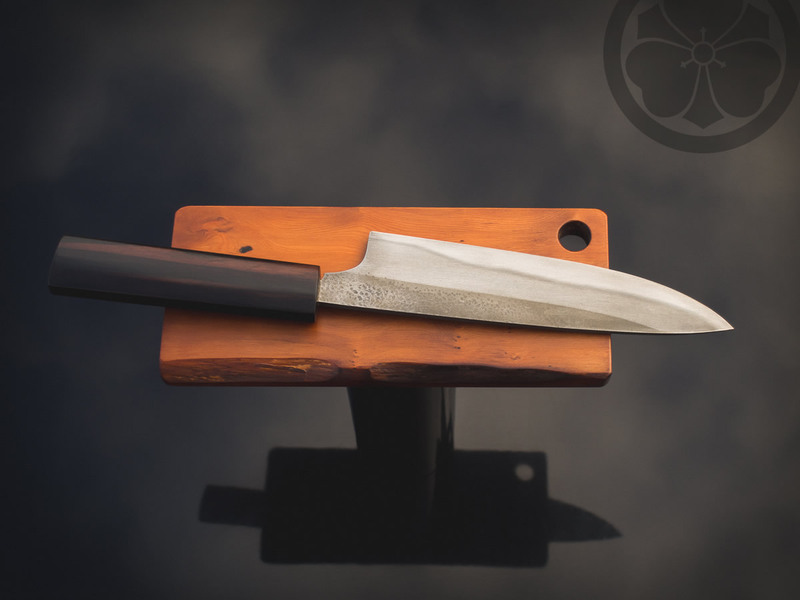 This knife is in a private collection in Victoria.